SAGUNT (SPA) – Great cyclism at Vuelta de Espana where the very high rhythm brought some athlete at worning-out. Today, the first one giving up has been Romain Bardet, the French racer gained the third place at Tour de France but already in Paris he seemed exhausted. In Sagunt we had a double for Poland, with the expert Tomasz Marczynski (Lotto Soudal) winning and Pawel Poljanski (Bora Hansgrohe) behind him. Third was the rookie Enric Mas (Quick Step). They were all part of a breakaway with other 37 athletes, later reduced to 28 and then 23, which started during the first of the five daily uphills. The beauty of cyclism anyway is the fight between champions. Today finally Alberto Contador performed a great attack to which just Froome, Tejay Van Garderen and Carlos Betancurt resisted. The Colombian is another positive news, as he was back to the condition of the good times until the bad luck tricked him: Tejay Van Garderen missed a turn crashing against him, resulting in a dramatic fall. He managed to reach the finish line with 12’ of delay, but later he resigned. What about Vuelta 2017 up to now? Everyone started fast, and we will enjoy the next days. It is impossible to keep this rhythm for two weeks. 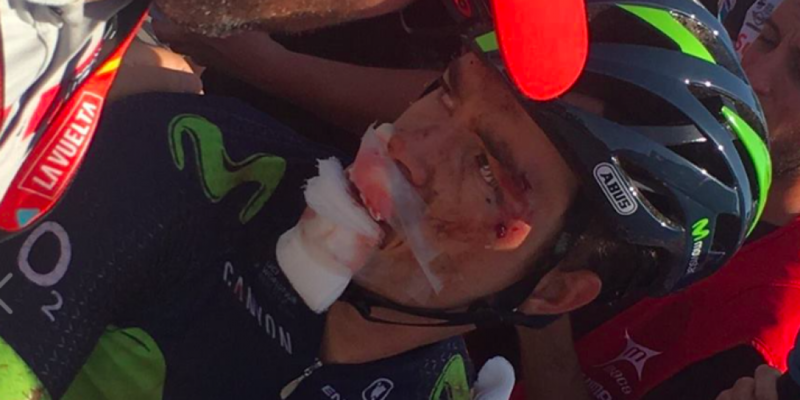 Vincenzo Nibali is still suffering but he gained a position in the ranking as Delacruz gave up today. Tomorrow other 200 kilometers with 3000 meters of altitude gain. We will enjoy.